Konkanis use Kulith (horsegram) very frequently in cooking especially in cold season. It is supposed be to be garam – i.e. warming effects on body. We normally don’t use it in summer because of warming effects. 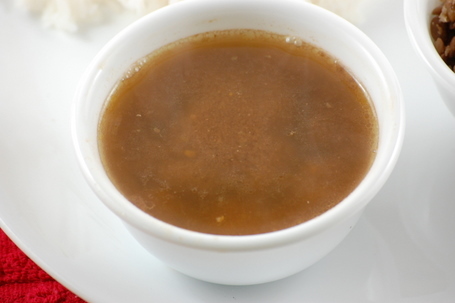 This saru – a thin gravy of soup like consistency, is very common during these days. A generous quantity of ghee is also added to the saru as ghee is also supposed to have garam effect. The water from cooking horsegram is used to make this saru and the cooked horsegram is used to make stir fry or kosambaris(salad). I usually make two types of sarus. One with the coconut and this is the second version. My grandmother used to tell us about a unique way of making this saru. Horse gram was used to feed the cattle. So they used to cook horse gram in large quantities. Instead of discarding such a huge amount of this very nutritious water, they would boil the water till it reduced to a small quantity and save it for using it in the days when this gram was not available. This thickened horse gram water was called “Kulitha kattu“. When needed, this was diluted in water and the saru was prepared. I have never tried this here as I cook the horse gram whenever required. Horsegram is good for arthritis (Ganti duuk) pain. One of my relatives who had arthritis was taking some homeopathic medication and the doctor had suggested eating horse gram. Horsegram changes color as it becomes old. When it is very fresh, it has a lighter color, and as time passes, it becomes very dark. Wash 1 cup horse gram in water. Add about 3 cups of water and cook in pressure cooker. (Soaking the horse gram for few hours helps in cooking faster). It normally takes a very long time compared to any other pulses/grams. About 5-6 whistles. Separate water and cooked horse gram. Save both. Add onion, salt and green chillies to the horse gram water and bring it to boil. Grind 1 tbl spoon of cooked horse gram and add it to the boiling mixture. Cook till the water reduces a bit and gets a bit thicker. Take off heat. Heat ghee and add garlic. When the garlic turns brownish, add this seasoning to the saru. Slightly crush the cooked horse gram (do not make a paste). Dilute asafoetida in 1 tea spn water. Add this to coconut. Add green chillies, salt and mix well with your fingers (chirduche). Now add the cooked horse gram and mix well. Add the coconut oil and mix. 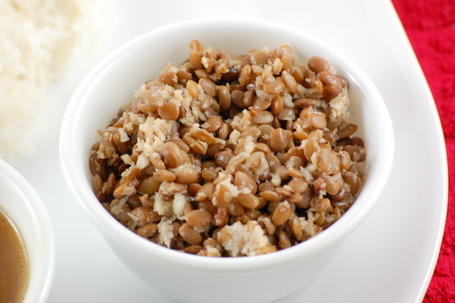 Wow..i simply love kulith saru….its a comfort food specially during winters or rainy days! Kosambari is new to me….got to try it next time. Thanks for sharing. Love this series of recipes! What is horsegram in your langauge? Do you know the word in Hindu/Malayalam/Tamil? Looks mouthwatering. Never knew onion is added to saru also I call it Upkari, did not know it is called as Kosambari. We make horsegram saru and palya similar way..looks delicious shilpa. Hmmm…megele ammalo udgaas ailo..D has banned me frm buying this, as once I forgot to pick it! 😀 He cd find more grime ! My side saaru is made wt exception of ghee n onion..rest same..must try ur version when I can sneak in Kulithu..the other we used to have as upkari, side dish …thanks for sharing your version..mae me nostalgic! I knew horsegram was good for joint pains etc. but the rest of the information is an eye opener! Dishes look great too – esp. the saaru! Wow Aunty, I’ve lived with Kulitha saaru and upkari all thru my college days, but still seem to like the Saaru even today..We put in some bhinda sol too in the saar. Kosumbari with it sounds very good. Shilpa, you might want to correct the typo for gravy at the title. Thanks, Aayi for posting my favourite dhanya recipe – off all dhanyas, kulith is my dad’s and my favourite. My mom used to make Kulitha Saar-Upkari. And she always used to serve it with “Piyava Chutney (Onion Chutney)”. This combo is awesome. I am sure adding the onion to the ssar would definitly make it yummy..
Vaini, I tried this last evening. Cool… this one is also going to be tried :). I am a Maharashtrian and we make Kulit pithle (just like besan pithle minus the onions). Its my all time favourite. I have never tasted kulit saru, will give it a try. Thanks. this is interesting. I never knew kulith was called horsegram. Kulith Pithla is my favourite, but hve never seen the flour in any store in the US. I also have heard only of the kulith flour, never of the grain as such. I just love Kulith,the above receipe is actually new .My grandmother is from Konkan(Kharepatan,Maharashtra).The kulith pithala is eaten on a regular basis, at my home in India ,we call it “Hulgyacha Zunka”.I used to drink it like soup…yummy My Aai gave me some kulith when I came to US. I often made it as it is very cold at my place here in US.Now it is over[:(].but your receipe has refreshed my memeories and taste buds too. This seems to be a yummy recipe.. my mom made a similar thing. Can you please tell me where you bought the cute porcelain katoris from? I wanted to buy it, am looking for something to match my corelle dinng set. Your help is highly appreciated. Shilpa: We have exact same 2 sets. Mine I bought here in US, for aayi we bought it in India (a grocery bazaar in Kumta). Shilpa, Thanks so much for your quick response. I live in the US, where did you buy it in the US? I really want to get one. Happy new year to all of you. Thanks a lot for the lovelly recipe. A poor farmer comes home to sell his produces from his field and i buy some just to help him out. Last time he had only horse gram and i bought though i didn’t know what to do with that. Now i know what to do! thanks a million for this recipe which i received on right time. what a coincidence! I was thinking about kulthacha pithla thoday morning and was very sad as i can’t make it cuz i dont know where to buy kulith from! do you know if we can find it here in US? in indian grocery store??? or did you get it from india ? Shilpa: You get it in Indian store. Thank you for posting this! My mom used to add chopped tomatoes to give it a tangy taste. Where can I get Horsegram in USA? Keep them in water for some time so it wont get decolourise. Finely chop green chillies (if you want to avoid the chiil pieces grind them into coarse paste and coriander leaves. Squeeze the Gabbe Slices and chop them finely. Mix the chopped onion, green chilli, coriander leaves and gabbo with salt. Add thick curd to it and mix. Now take 2 tsp oil in a kadai add urad dal and mustard seeds, when it starts to splutter add hing powder, karibevu and pour it on the salad. It tastes very good and very helathy for your body. I just came across your site when i was browsing thru to find a recipe for dal. Ur recipes look really gr888. Please post some more recipes on vegetables. Most of the sites have recipes for veg but are not simple enough for everyday use..those can be made for special occasions only. I would really like to see some simple vegetable recipes. Where can I get this Horse gram in U.S.A? I live in NJ near edison? Is it available in Oaktree road Indian shops? Can you tell me where u bought HG from?Thanks so much ! 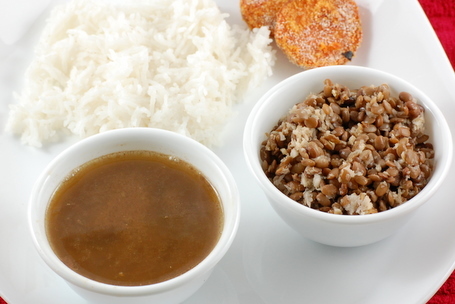 HORSE GRAM GRAVY is good for kidneys, its continuous consumption is advised by the ayurvedic doctors in the north india, so that their is no stone formation. and if there is a stone then it is disintegreted. It tastes even better when mangalore cucumber (sauthee)is added to the saar. Shilpa: I think it is called Kulthi in Hindi. hello!we make kulitha koddel also.horsegram in coconut gravy with a tempering of crushed garlic. I bought some horsegram from the supermart, but it does not look like the ones in your photo. the ones I bought more like chick peas. Are the 2 things different? Shilpa: I think the two are different. in response to Jennifer’s query,it is ‘Muthira’ in Malayalam. Hi…i love this saaru….but,wanted to know if any1 knows where i can get it in UK? i’ve been looking for horse gram for such a long time in uk,but,havent found it…any idea,any1 if i can buy it online?it wud be a great help. Incidentally i have some sprouted horsegarm.half of which i made the usual ammti, but they were not so soft(NOw i know i need to cook longer). Usually my MIL use to make this. I will definitely try this tomorrow. Hi, I love making ur receiepes, they turn out great. I made horsegram idlis today and yum had them with gunpowder in yogurt so as not to have oil, they were yumm! we call it Hurulee Saaru in Kannada. I love this Saaru and the Palya. Its real Yum!!! what do we call in Hindi? I love MUTHIRA (in Malayalam) dish. Soak 250gms Horsegram overnight(12 hours)..cook next day with atleast 5-6 whistles in a pressure cooker. Add one tspn coconut oil in pan…when heated, add crushed 4-6 garlic pods when golden brown…add 1 tspn chilli powder & stir and then add the cooked Horsegram(as option grated coconut can be added) with stalk…. add salt to taste….allow to simmer till stalk is dried..Stir & Serve hot…Yummy!!!! I’ve been reading all the comments and it looks like’kulith recipies’ are gonna be tasty and delicious.I’ll definitely try it out. I’ve also heard that kulith is good for health and helps in getting regular menstrual periods. Can anybody please tell me in what form and what quantity it should be eaten? Thank you for the recipe. Eeryone loved it.